Busy times lead to a lack of posts (finally missing that monthly schedule that had built up recently). I've got some longer form stuff drafted but not the time to spin it all into a cohesive whole and publish. But I just finished Beyond: Two Souls and spat out a few quick thoughts so why not post them here. I played the front half last month but got busy and ended up not having the time to do the back half until now. This game benefits from being able to play large chunks of it at once due to a narrative that jumps through time for seemingly very little point beyond a desire to somewhat poke at what the player knows - it certainly doesn't help it being a game about consequences, and I suspect it means that a lot of the time the scenes don't actually have any beyond tweaking some dialogue in chronologically later episodes that you also play later on: ie this presentation prevents even such minor consequences for those events played out of sequence. Each scene isn't enough for a chapter and often they combine into an arc but not necessarily for sequential play and that involves a bit of memory use. You'll miss out on the (Cage quality so not stellar) story beats if you're not able to recall what happened in previous sequences when you arrive at subsequent once. I know you can push against what might have been a fixed narrative (so the game is only better in this respect than 98% of other games where the narrative arc is a movie you have absolutely no choice in*), because for one of the story beats I had no interest in pursuing it and the story was quite insistent that it wanted it to happen (came up in 4 scenes), which was somewhat jarring but still kinda worked. The player character should feel like this jerk needs to get lost, but the dialogue wasn't quite on target so it felt like it was trying to lead to a path that I was hutting down and the scenes were slightly off due to it. Talking of the dialogue, they still need to get a writer at Quantic Dream but with good acting (Dafoe ham is always good ham in my book; Page didn't phone it in even if maybe a few more takes would have been nice - but that could be the curse of Cage more than anything else) and a cast that doesn't sound like French Canada invaded the USA it feels a lot less bad than in Heavy Rain. It's a shame as I cared more and was more interested in the entire path of Heavy Rain than Beyond but going back will be harder now I've played a game where they spent some money on the VO to actually sell the dodgy script. About half of Beyond was stuff I didn't feel grabbed me (could be related to lack of consequences), lacked enough skill in the writing to actually pull off the intent, or was just barely enough of a scene to justify not being a cutscene. Heavy Rain felt like a game about consequences (even when it kinda wasn't if you played a second time to get a better feel for the actual limits of what could change), Beyond is a game about choices (what do you want to happen in this scene, who should get their way from the conflicting desires) and it doesn't even have all that many choices as some paths seem far more the 'right' way that the scene was intended to run (in so much as to not do it means the scene ends early without any development). If they keep this level of V.O. work up, move to PS4 to get out of the aliased 720p render quality issues, and HIRE A DAMN WRITER then the next game could be really special. One of the few points of consequence is the ending, and I think the game got lucky in winning me over when I picked the sensible options for my Jodie and so got the cool ending (Zoey). While I knew what I wanted for the character and so was picking the ending I wanted, I didn't realise (at the time I was choosing) that I was going to get the Terminator (mixed with inFamous and Dollhouse) final sting after the conclusion. So that was a note of unexpected awesome to run credits on and possibly saved me from saying the Quantic Dream games are a series of titles whose stories get worse and worse while their acting and production get better and better. Possibly saved me, maybe I'll revert to thinking that with time when I've forgotten squeeing about Jodie & Zoey saving the world after the fall. Definitely only a game for fans of the genre (big budget interactive drama with the Cage taint) but not bad going - anyone who enjoyed Heavy Rain probably needs to find a cheap copy of this. And Quantic Dream doesn't even need to pretend to be a small indie to get the press to go easy on their games and forgive the technical shitshow and unengaging mechanics that often come with the genre (QD as a studio is the same size as Telltale Games - try and find one writer who treats their output in any way similarly). Oh, and Boyhood may have won hearts for being filmed over 12 years but a PS3 has shown what a crappy parlour trick that is when CGI allows people to act as someone else. Ok it's creepy, still climbing out of uncanny valley people who can't really touch anything because soft-body physics doesn't really work in games (especially as most don't even try) but there's still a full cast who age 15 years throughout this game (including a kid) and it's no biggie. 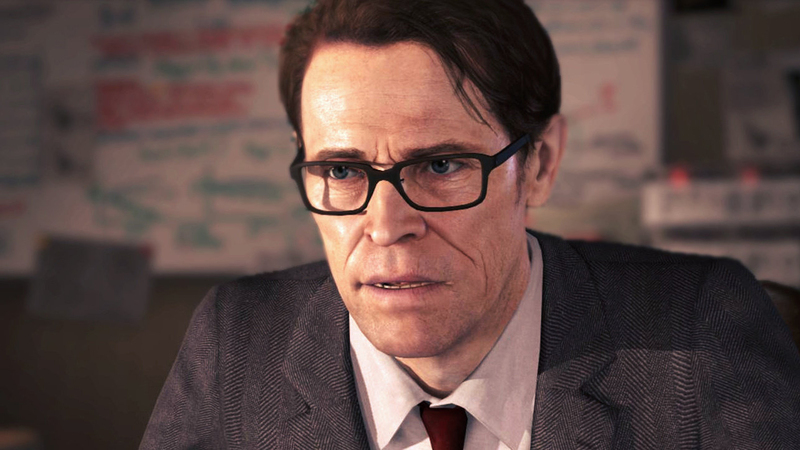 That said, when is Dafoe (the actual person) not ever so slightly in the uncanny valley? * ie games where a lot of the narrative that is developed as unique (because the interactive nature of games means we can do some things, the controller is more than a custom crank for a film projector) is technically headcannon; see my views on the Last of Us with Joel not using guns while Ellie was an expert sniper - that's how I played the games but during any cutscenes that was pure headcannon, it's just headcannon that coloured how I interpreted the fixed narrative of that story and could be expressed during gameplay. We become mixed into the characters we play as because any character where this is not true is a NPC, by definition.